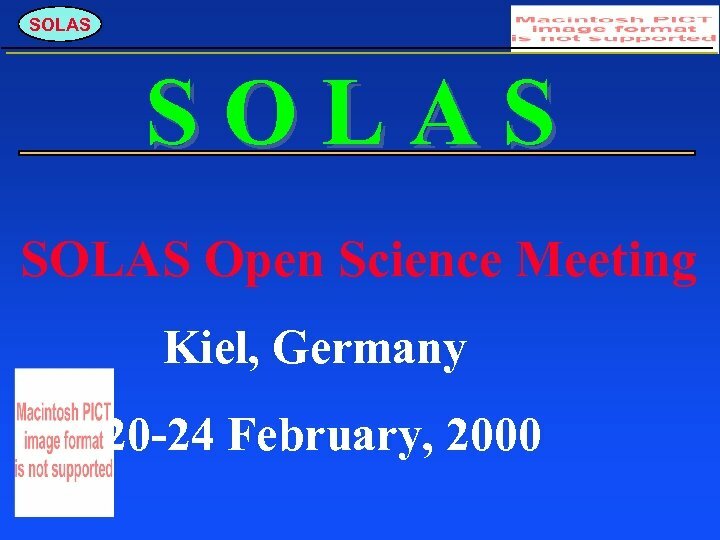 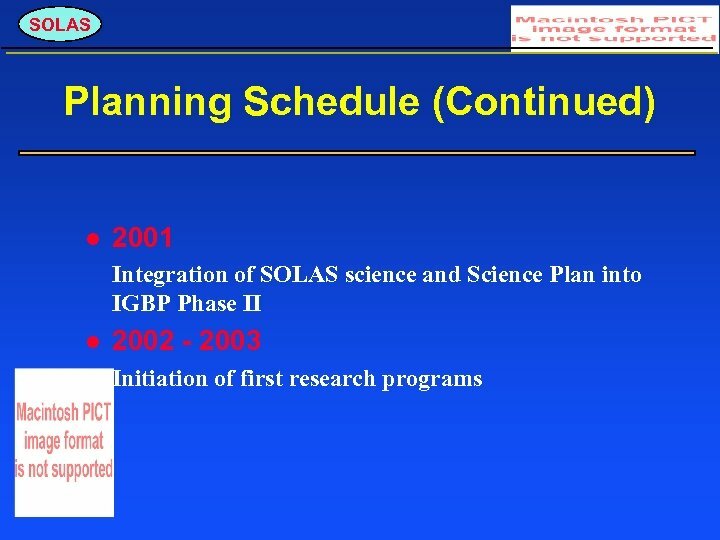 SOLAS Philosophy of the Programme Use hypotheses to ensure that observations and experiments are relevant to understanding key interactions. 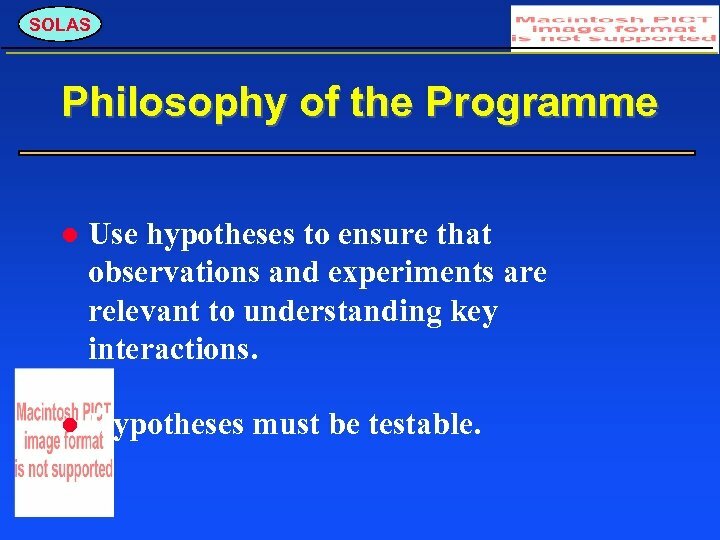 Hypotheses must be testable. 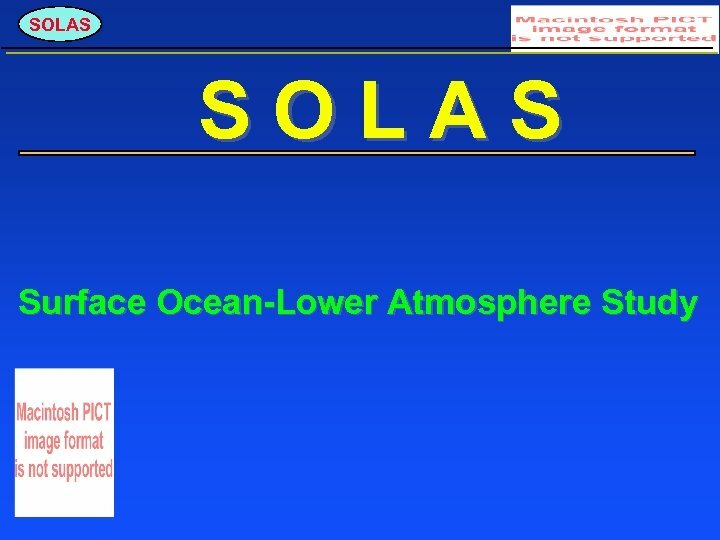 SOLAS WCRP and SOLAS Physical interactions between the ocean and atmosphere a critical part of SOLAS. 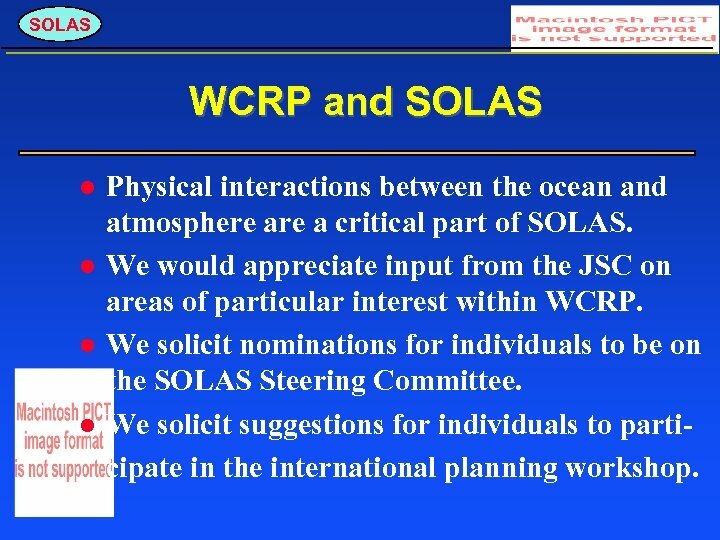 We would appreciate input from the JSC on areas of particular interest within WCRP. 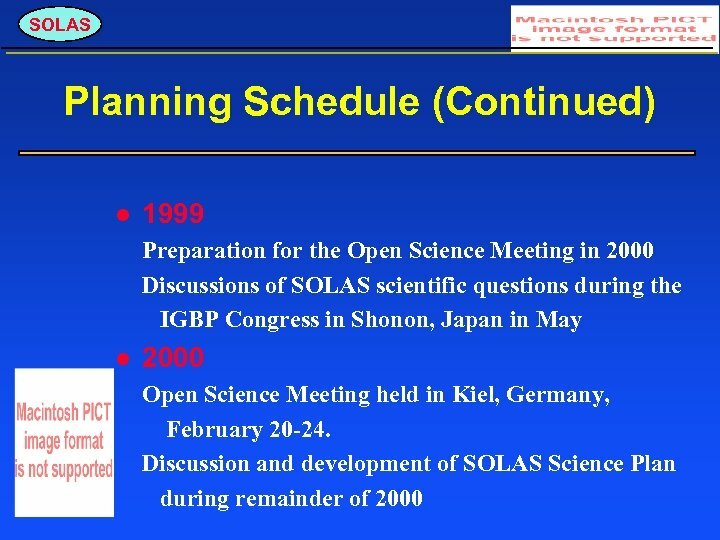 We solicit nominations for individuals to be on the SOLAS Steering Committee. 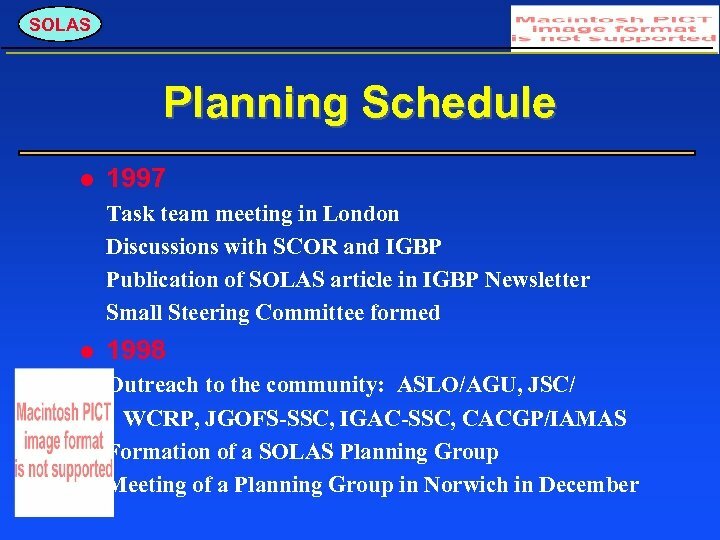 We solicit suggestions for individuals to parti cipate in the international planning workshop. 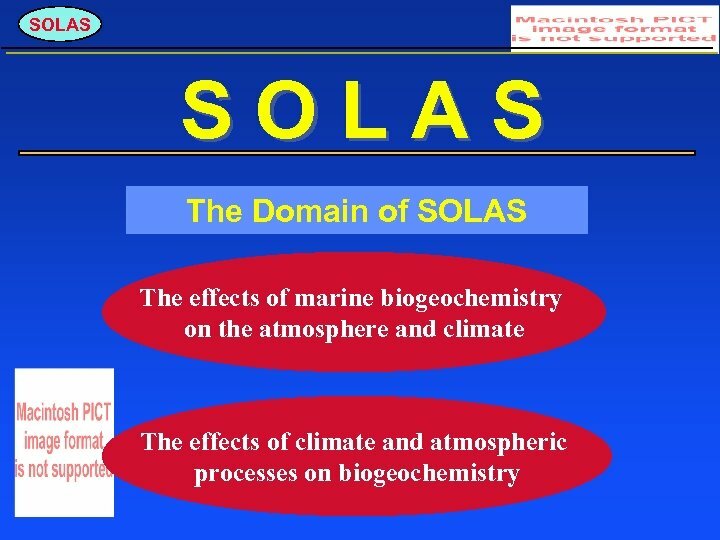 SOLAS Sample Questions Are changes in marine biogeochemistry in the next century likely to have a significant influence on the net oceanic uptake of CO 2? 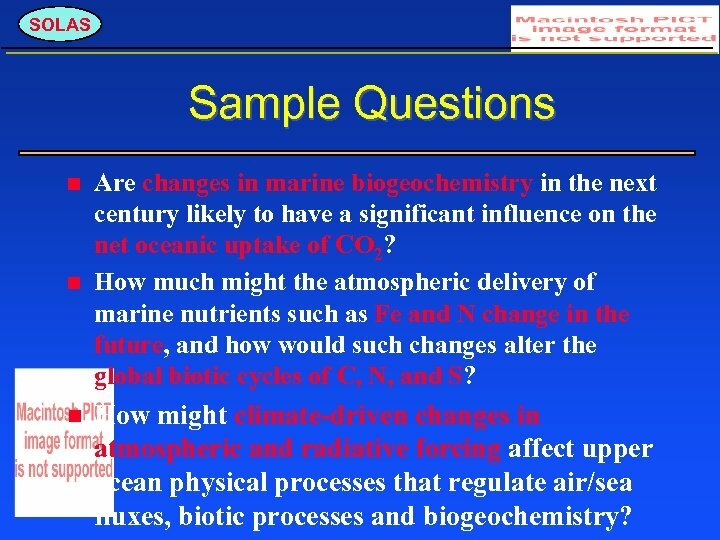 How much might the atmospheric delivery of marine nutrients such as Fe and N change in the future, and how would such changes alter the global biotic cycles of C, N, and S? 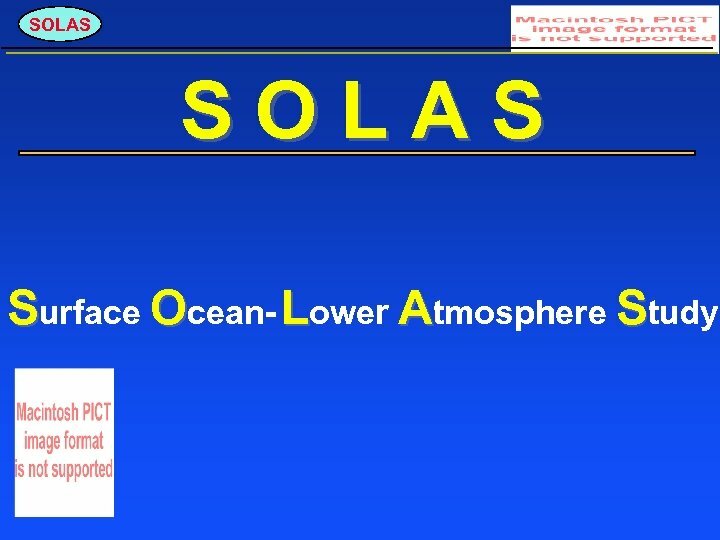 How might climate-driven changes in atmospheric and radiative forcing affect upper ocean physical processes that regulate air/sea fluxes, biotic processes and biogeochemistry? 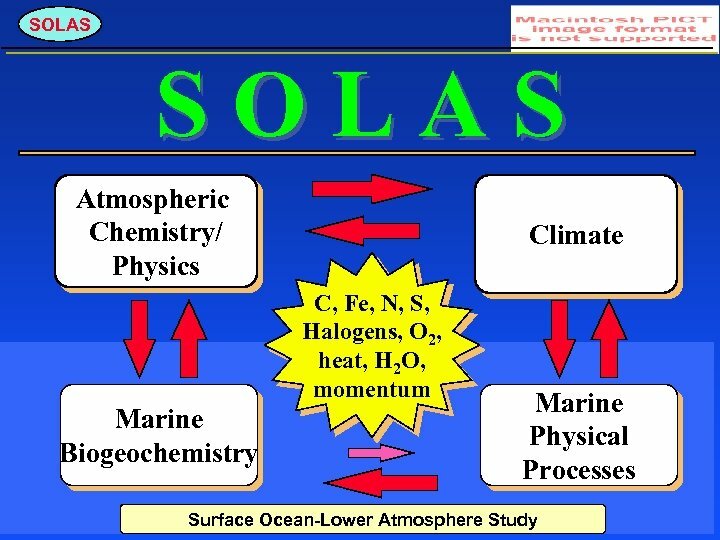 SOLAS Sample Questions (contd. ) 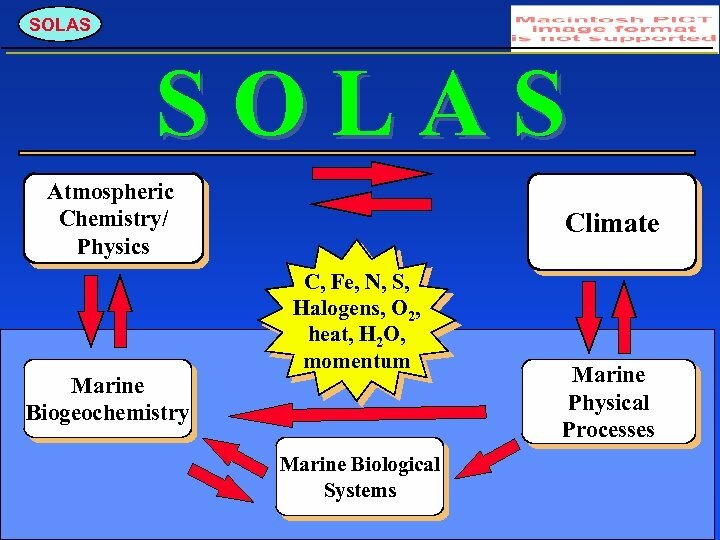 To what extent might marine biological sulfur emissions change in the future, what would cause such changes, and what are the climatic implications for the hydrologic cycle and radiative budgets? 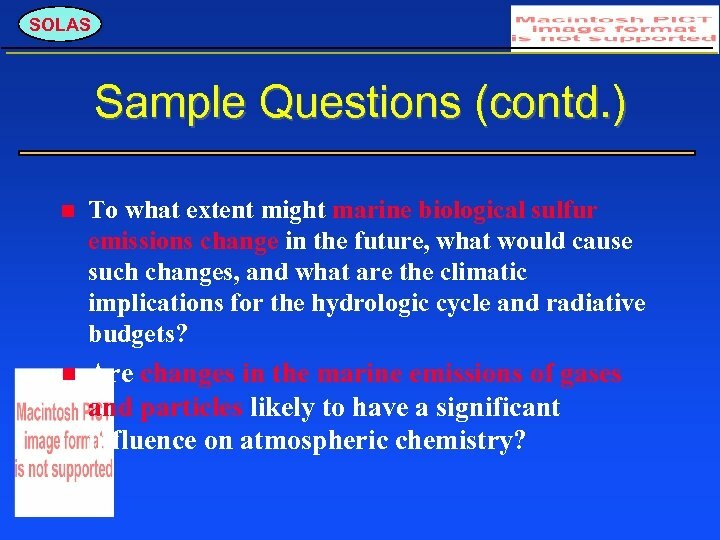 Are changes in the marine emissions of gases and particles likely to have a significant influence on atmospheric chemistry? 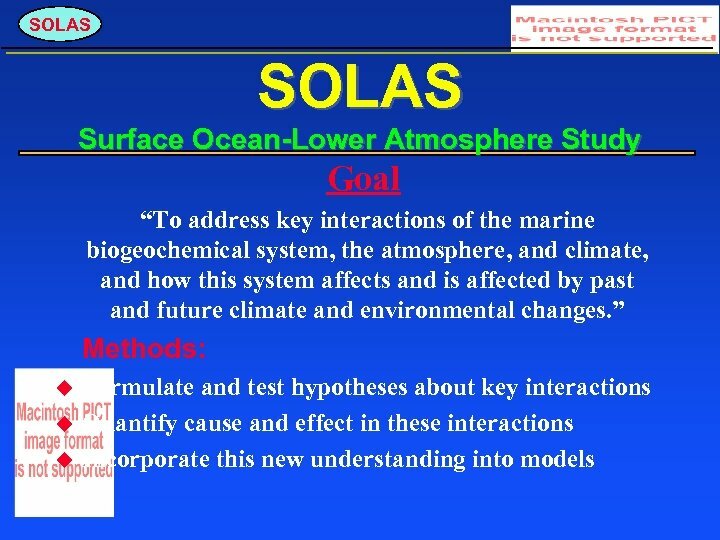 SOLAS Sample Questions (contd. ) 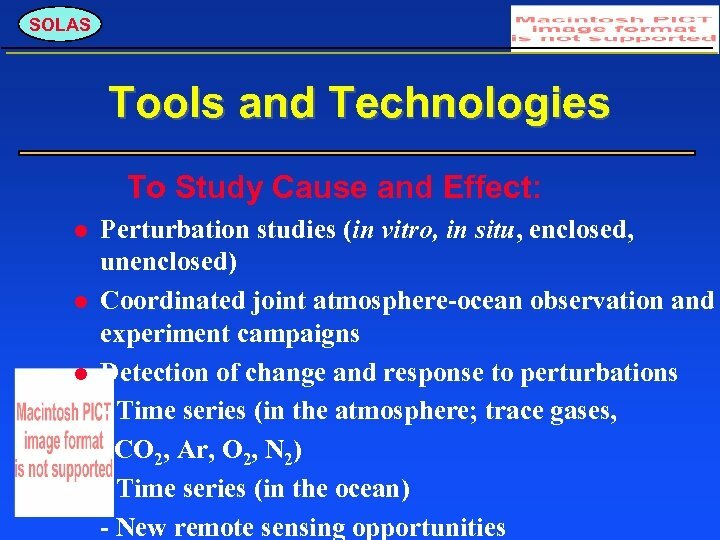 Are changes in the spectrum and intensity of radiation likely to affect the production of trace gases, nitrogen fixation, or other biotic processes in the surface ocean? 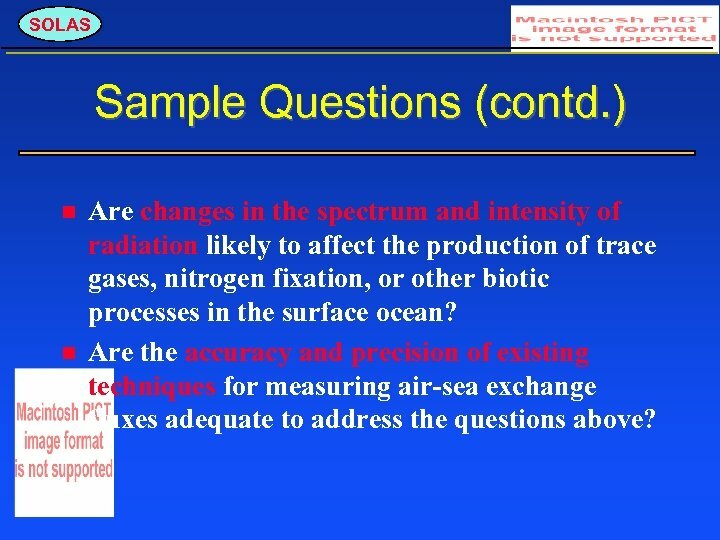 Are the accuracy and precision of existing techniques for measuring air-sea exchange fluxes adequate to address the questions above? 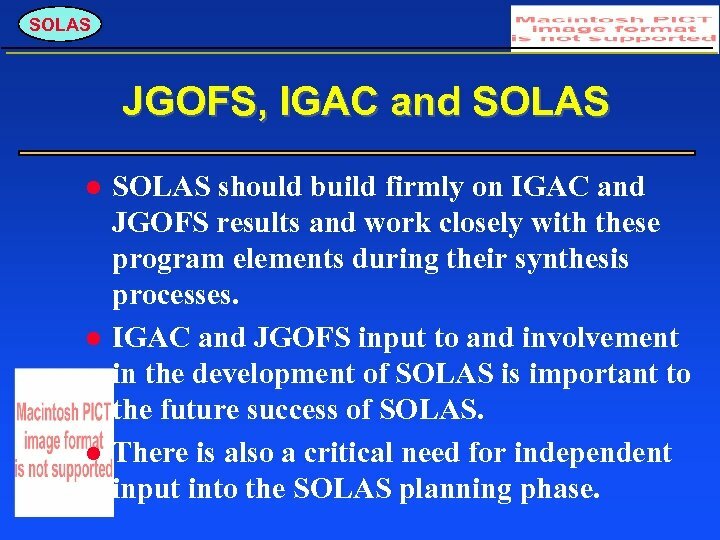 SOLAS JGOFS, IGAC and SOLAS should build firmly on IGAC and JGOFS results and work closely with these program elements during their synthesis processes. 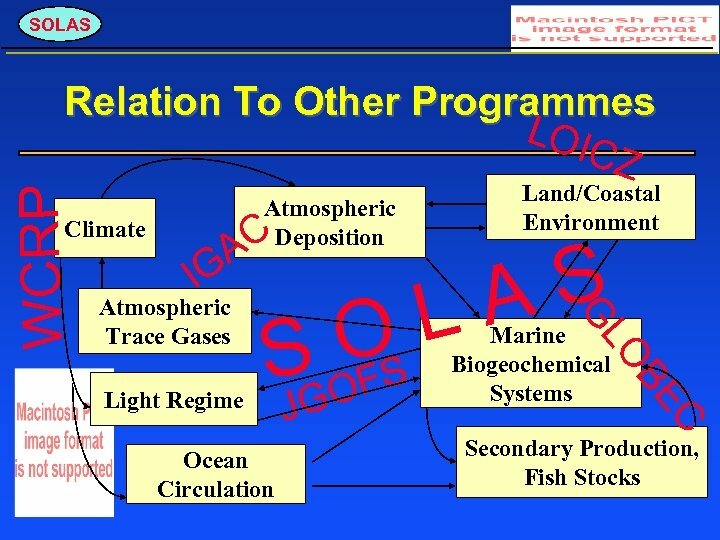 IGAC and JGOFS input to and involvement in the development of SOLAS is important to the future success of SOLAS. 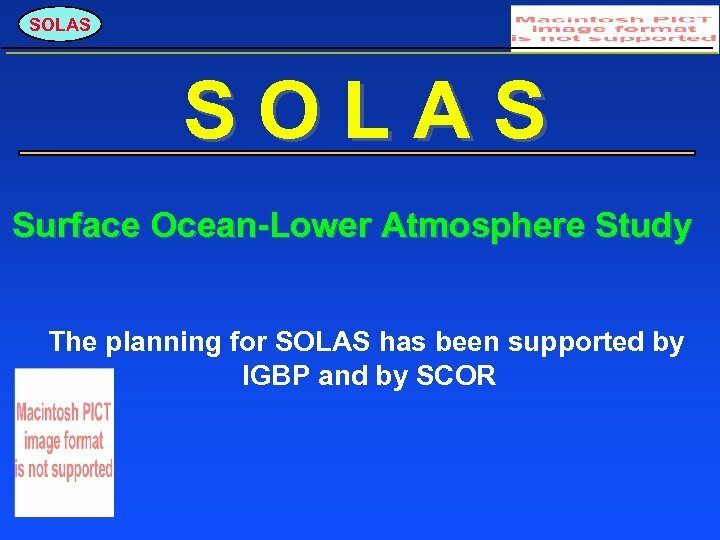 There is also a critical need for independent input into the SOLAS planning phase.